Our recent blog covering the relationship between SEO and PR shared the good news that content marketing remains a valid and successful method of supporting search engine ranking. 72% of content marketers use website analytics to research target audiences; 40% use conversations with customers. Most content marketers use email campaigns (86%) and educational content (75%) to nurture their audience; only 25% offer opportunities for community building/audience participation. 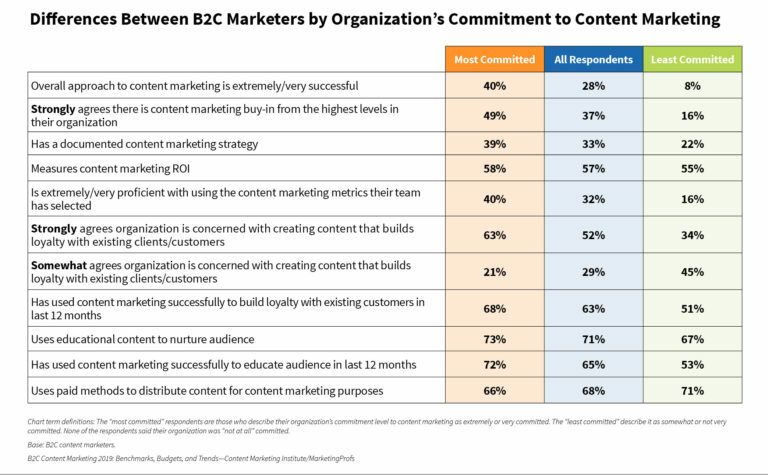 CMI’s research shows that educating and building trust are priorities to successful content marketing efforts. Companies are getting it that content should be helpful to the customer, giving information that is of value rather than simply selling to them. Create and share content that provides value on a consistent basis, that adds to previously shared content. Determine what content is valuable by reviewing data analytics, social listening, talking with company call center reps to learn what customers are asking for and about, and engaging with customers at live events. On the B2C side, a similar finding is true. Where B2B marketers are focusing on building trust, for B2C marketers, it’s loyalty. “Eighty-one percent of B2C marketers surveyed say they’re concerned with creating content that builds loyalty with existing clients or customers.” Education is also a key point of attention as well, with many marketing teams going so far as to create online courses for customers to take. The CMI report research shows that the higher the commitment to creating content that strengthens customer loyalty, the more successfully the content campaign reaches its goal. And what about us? How are we using content marketing to attract new business, and, are we doing it as well for ourselves as we are for our clients? Agencies’ satisfaction with their own content marketing efforts is up from the previous year and, as with B2B and B2C, the higher the commitment, the higher the success rate. For agencies, the key components of successful content marketing are storytelling and community-building. Tell your agency’s story by showing who you are and how you work. Feature team members, share the story of your agency and showcase your work with case studies. Use email marketing and other means, like Facebook groups, to build community. It all comes down to the essence that people do business with other people they know, like, and trust. Achieve all three with a strategic content marketing campaign.